The idea to organize an Ewe Church was introduced on August 28, 1982 at a gathering organized by a six member Welfare Group to give support to a member of the community whose father had died suddenly in Ghana. The late Dr. Kofi V. Asamoa espoused this wonderful idea. He realized the need for a spiritual revival in the community. Three months later on November 25, 1982. Dr Asamoa repeated his appeal to the Ewe Community to respond favorably to the idea of forming an Ewe church. Some heeded the call and on Sunday, December 19, 1982, the first Ewe church service was held in Lanham, Maryland at Dr. Asamoa's residence. On Sunday, January 9, 1993, the church was moved to a new location in Bladensburg, Maryland – the residence of the late Sostenes Kwasi Abbah. As the church quickly over grew the worship place in Bladensburg, search for a bigger place, preferably, chapel began and on June 17, 1984, the church moved for the second time to the Little Sanctuary on Washington Cathedral grounds. Exactly a week later, on June 23, 1984, the first baby - Sefe Esinu Ama Azuma - was born into the Church. (Now we can all tell the height of the church). The move from Maryland to Washington, DC was costly in terms of growth. The church started to experience decline in membership and before long it was faced with numerous challenges ranging from identity crises, pastoral, financial and leadership issues. At the start of all these, the pastor walked away from the church claiming the President/Founder asked her to leave. The church was without a Pastor. The President/Founder took over delivery of sermon on Sundays. On June 22, 1986, the first baptism was performed; and the first exchange of marriage vows took place in the church on March 28, 1987 – different visiting Pastors performed both ceremonies. In our need and search for a Pastor, we contacted a Doctoral student at Princeton University Theological School – Rev. Setri Nyomi, an ordained Pastor of the Evangelical Presbyterian Church, Ghana. Rev. Nyomi responded to our need and became a visiting Pastor commuting from Princeton, New Jersey whenever time permitted. Upon graduating and accepting appointment to Trinity Theological Seminary, University of Ghana, Dr. Nyomi discussed the church's pastoral needs with Rev. Albert Wurapa, an ordained and senior Pastor of Evangelical Presbyterian Church, Ghana. Rev. Wurapa was then in retirement and leaving in Lancaster, Pennsylvania. Rev. Wurapa came out of retirement in Summer 1990 to help build the church. The church was happy to have an experienced Pastor. Most of us thought the problems of the church and the challenges it was confronting would quickly go away but they did not. However, membership in the church started to increase and this is because the church filled the spiritual vacuum that existed and the Ewe Community became vibrant with activities. While this was happening, the church again confronted with serious leadership struggles. These led to partisanship. Love for one another gave rise to hatred. with people from outside (most deemed not to be members of the church) in March 1995. Some of these people still hold on firmly to the managing of Ewe Church of Washington. The take over caused the disintegration of the church. With exception of the President/Founder all the original leaders including the Pastor left the church and started a new congregation – Trinity Congregational Church. In Spring 1995, the new congregation started worshiping at 6210 Chillum Place, NW, Washington, DC. The congregation sought more of spiritual growth in the early stages. It also made numerous attempts to reconcile its difference with Ewe Church of Washington. In early February 2002, Trinity Congregational Church moved to a new home – 12800 New Hampshire Avenue, Silver Spring - Colesville Presbyterian Church to share their facility. In early Summer 2002, reconciliation efforts between Ewe Church of Washington and Trinity Congregational Church were reignited for the second time. 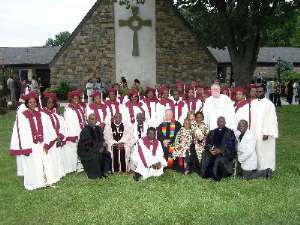 On Sunday, December 22, 2002 the first joint service between the two churches was held at the worship place of Trinity Congregational Church; and on Sunday March 9, 2003, the second joint service between was held at the worship place of Ewe Church of Washington – Washington Cathedral grounds. The following month was scheduled for the usual reconciliation meeting, but for whatever reasons, Ewe Church of Washington called it off and no attempt has been made since to reconstitute it. The internal strife within the Ewe Church of Washington did not cease even after the departure of the original leaders in Spring 1995. In late Spring 1999, the President/Founder died. On July 4, 1999, the congregation abolished the position of Church Administrator. This action led to a section of the congregation leaving the church. In April 2000, the Ewe Church of Washington appointed Rev. Gift Agama Pastor of the church and Rev. Kennedy Odzafi continued with his services to the church as visiting Pastor commuting from Pennsylvania. When Rev. Agama fell sick and could no longer perform his pastoral duties for the church, Rev. Odzafi took over as Interim Pastor and relocated to Maryland. While the congregation and the Ewe Community were eager to see the reconciliation become reality, the leaders of Ewe Church of Washington were in secret negotiations with Evangelical Presbyterian Church of Ghana (Global Evangelical Church) for a new Pastor. In May 2003, Rev. William Amedeka arrived from Ghana to assume the position of Pastor of the church. The congregation protested seriously and objected to the appointment since the decision and the appointment were made without the congregation's approval. This brought another misunderstanding within the church and with the incident of law enforcement officers coming to the church, a section of the congregation decided to leave the church and worship on their own. The break away group organize themselves into forming Ewe Church of Silver Spring and worshiped briefly at 10309 New Hampshire Avenue with Rev. Odzafi as their Pastor. The idea to be one and worship together as a people was never lost. Discussions quickly took place between Trinity United (Congregational) Church and the Ewe Church of Silver Spring. In September 2003, a joint congregational meeting was held between both churches to approve a merger. The name Ewe Church of America was adopted. On October 5, 2003, Ewe Church of America held its maiden service at 12800 New Hampshire Avenue. Attendance was 150 adults and 43 children. This is a new beginning and we will continue with our efforts “that we may all be one”.